I picked a girl's mountain bike out of a dumpster . It looks very excellent except for a chain that is so rusted that each link needs to worked free. Name is Techno Lite , 26" wheels, 15 speed Shimano, center pull brakes Lee Chi. I know it is not the caliber of bike that most posters here have, but I have a 11 year old granddaughter that could ride it ; a "starter" bicycle to see if it is something she would be interested in. My guess is some one rode on a salt water beach then put it in a garage for years without rinsing it; the chain was essentially solid. Question: Should I oil the chain and work it free or buy a new chain ? If the chain isn't worn (which it probably is not, kids bikes don't get high mileage) it might be worth trying to save, but you may end up spending more compared to getting a new one. Penetrating oil, a wire brush and a lot of effort may free it up enough and get it reasonably clean. Removing the rust chemically is problematic. Something strong enough to work with the chain in place may damage paint or plastics. There are safe products such as Vapo-Rust but the chain would need to be removed and soaked for an extended period of time. Also, new chains for 10 or 15 speed bikes are inexpensive. Instead of buying chemicals, just buy a chain. With his sets including the chain break tool, all chemicals and some replacement parts, ranging in price from $69,95 to $249,95 you're good to go. But let's get serious - as many say, it can be done. It only depends on economy, i.e. your imaginary hourly rate. 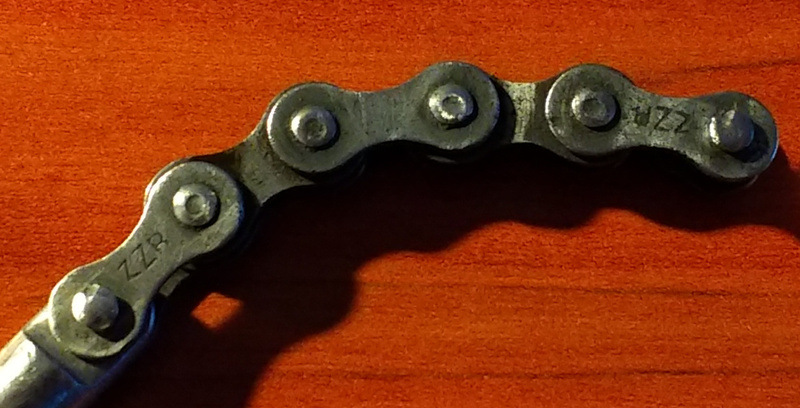 Be prepared to spend couple (2-3) hours on cleaning the chain and making it work more or less properly. And all this in hope that the chain has proper dimensions (is not overstretched). It's a piece of chain that started rusting in the early '70s. After soaking it in phosphoric acid for about a quarter and then cleaning, lightly sanding (120 grit if I'm not mistaken) and polishing it with some paste for a following quarter it's the result I got. And it's only 5 out of more than a hundred links. Was it worth? Financially not. And I wouldn't put this chain on a bike (reliability and the ease of maintenance). I did it because a) it's a respected vintage brand from where I come from, this chain has some interesting history and I was making a key-chain (pun intended) for someone to keep this as memorabilia. - phosphoric acid is a hazardous substance with corrosive characteristics. At moderate concentrations phosphoric acid solutions are irritating to the skin. Contact with concentrated solutions can cause severe skin burns and permanent eye damage. If there's loose rust, of course you should remove it; a wire brush is all that needs. The real problem is inside the pin joints, and usually a penetrating oil (or WD-40, or kerosene) can rinse that out. After the joints are free, blot dry and put on a real lube (I've liked drip bottle Tri-Flow, White Lightning gets good reports, too). The little solid microbeads get into the pin area and stay; even after most of the oil washes off, and despite surface rust, the chain can work fine for years of commuting. Oxalic acid (depending on time and concentration) can etch the bearing surfaces, or remove the black oxide (not much rust protection in black oxide, but it's better than bare metal); I'd avoid that. Yes, it dissolves rust, but even an infrequently lubed chain ought not to need that. Are rusty disc brake pads a worry? Can this bike be saved from the rust?